Pack of 8 Units(Jar Not Include), 20 Micro Starry LED Silver Copper Wire Lights, Warm White,6.5FT/2M,Battery Operated,Waterproof,Mason Jar Decor Lights,Moon Lights,Best for Party,Wedding,Christmas Decoration. 8.Notice:Copper Wire Parts is waterproof,Battery Box is Not Waterproof. Best for Decorate Home Party - These Starry String lights are Bright Warm White Color, Warm Light Sway Freely, Romantic Breath Pervasive Everywhere,Provide You a Warm Atmosphere and Feeling of Dreaminess, You can also Make a Stunning Centerpiece for a Lovely Dinner Party or Decorate Wedding Reception Table etc. Easy to Make Fairy Dresses/Costumes - This String Fairy Lights are Perfect to Making a Cool Fairy Dress, Halloween Costumes, Wedding Gowns, with Ultra Thin Silver Wires and 20 micro Starry LEDs and White Mini Battery Case Can be Very Easy Hide, You will Definitely Get Lots of Surprises with Such Beautiful Fairy Lights. For Mason Jar Decor Lights or DIY Wine Bottle Lights - Perfect Warm String Lights to Decorate Your Bedroom,Put in Wine Bottles or Mason jars for a Table Decorations.The Starry String Lights is Waterproof and Submersible,You Can Put it into the Fish Tank Under the Water,it will Looks Very Nice. Also the Wire is very Soft and Light, Easy to Winding Anywhere,Suitable for Indoor or Outdoor, Likes Windows,Chairs,Flowerpots,Garden,Christmas Trees and so on. 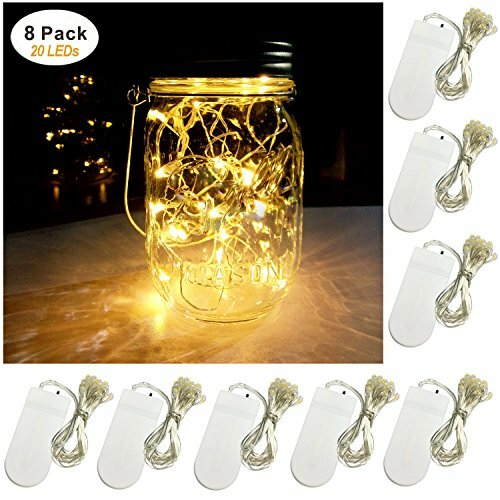 Pack of 8 units(Jar Not Include), 20 micro starry LEDs,warm white color（Need Other Colors,Please Search ASIN: 【B06XTQHHKV】),6.5ft/2m silver copper wire string,soft and light,easy to winding anywhere.Perfect for diy decorations. This wire string light is waterproof and can be submersible under water,suitable indoor or outdoor decorations,note the battery box is not waterproof. Mini size easy to hide - The size of battery pack is only 2x0.8x0.4 inch, which makes it very easy to hide into your desired decorations. This string lights powered by 2x 2032 Battery Cells (included), battery box is with ON/OFF switch, no need worry about where to find a power outlet. More than 2x24 hours lighting of continuous use battery working time,longer when used with breaks. Batteries are easy to change and replacement. If you have any questions about this product by Yitee, contact us by completing and submitting the form below. If you are looking for a specif part number, please include it with your message.